Use to either fix stripped out threads in Axial Rockster 2.2 beadlock wheels or to replace the stock cap head screws with button heads that won't get hung up on rocks. 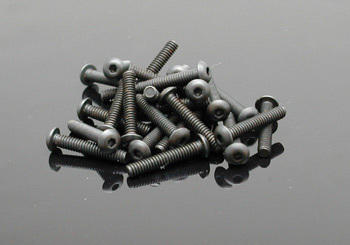 These standard (American) thread button heads screws have a slightly larger outside diameter and are longer then the stock screws that come with the Axial Rockster beadlock wheels. 24 each button head screws.